Joseph Bruce Ismay was born near Liverpool in 1862 to Thomas Henry Ismay and Margaret Bruce. His father was a senior partner in the firm of Ismay, Imrie & Company and founder of the White Star Line. Joseph was educated at Harrow and was then tutored in France for a year before being apprenticed to Thomas Ismay's office for four years. He travelled the world for some time and upon his return was posted to New York where he worked at the White Star Line office. After a year he was appointed the company agent for New York. In 1888 Joseph married Julia Schieffelin and together they had four children. The family returned to England in 1891, where Joseph was made a partner in Ismay, Imrie & Company. After his father’s death in 1899 Joseph became head of the business. 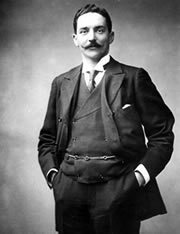 In 1907, Ismay met Lord Pirrie of the Harland and Wolff shipyard to discuss White Star's answer to the Lusitania and the Mauretania, the recently unveiled marvels of the Cunard Line. Ismay's new type of ship would not only be fast, but luxurious, with huge steerage capacity. Three ships were planned and built, the second of which was White Star Line's pride and joy, the RMS Titanic. On 10 April 1912 Joseph boarded Titanic with his valet Richard Fry and his secretary William Henry Harrison. Ismay was rescued from the Titanic in collapsible lifeboat C.
During his life, Ismay launched the cadet ship Mersey used to train officers for Britain’s Merchant Navy, gave £11,000 to institute a fund to benefit widows of lost seamen and in 1919 gave £25,000 to establish a fund to recognise the contribution of merchant seamen in the war. Joseph Bruce Ismay died on 17 October 1937, leaving an estate worth £693,305.